Wash strawberries, remove stems and pat dry with paper towel. Cover each strawberry with shiro-an (20 to 30 g each), stem-side down. Leave the tip of strawberries uncovered like this. It will show nice red color through the rice-cake skin. In a microwavable bowl, mix rice flour and water and knead well. (It may be easier to mix the flour and water in a plastic bag and knead, so that the mixture does not stick to your hands while kneading, then empty the bag into a microwavable bowl.) Often daifuku/dumpling recipes say that the dough should feel like your ear lobe, but microwave method requires more water, so don’t worry if your mixture turns out very soft. Cover with plastic wrap, not too tight so that steam can escape, and microwave for 4 to 5 minutes (with 500 W microwave). It may be better to take out the dough after 2 minutes, stir well, cover with plastic wrap again and microwave 2 more minutes. 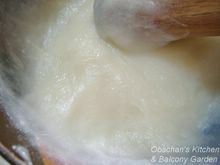 Stir well (with a wet pestle, if available) until the dough is glossy, soft and elastic, as in this photo. A strong arm helps a lot here. * They say that you can freeze this rice-cake dough, but I’m not sure how long it keeps well in the freezer. Could be about a month???? * I updated this part. This is easier and safer. Using a wet wooden spatula (or something similar), scrape out the hot dough onto a flat surface heavily floured with corn/potato starch. Let it spread flat and, while it is warm, cut into desired number of pieces with a dough cutter or something, also dusted with corn/potato starch. Dry your hands, dust well with the starch and shape each piece into a ball. 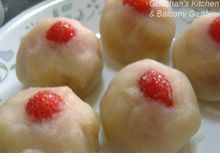 Flatten and stretch each of the small balls of dough into a thin disk, and wrap a strawberry-bean paste ball wit it. (Place the tip of the strawberry in the center of the disk.) Pinch the edges tight to seal. (Flour fingers well so that the rice cake won't stick, but try not to get much flour on the edges to be sealed together.) The sealed part should be the bottom of the daifuku. Shape into a ball. Sugoi! I wish my daifuku worked out like that! ^^ Anyway what is the difference between mochiko and shiratama-ko??? Thank you! Shiratamako is said to be finer than mochiko. When made into rice cakes, those made with mochiko are more elastic and sticky while those with shiratamako are more like dumplings. thank you for the information. Definitely got the idea. Looking forward to trying this recipe. Regards and happy days ahead. I wish you happy days, too. I tried your recipe! I blogged about it at http://gastronomer-von.blogspot.com. couldn't find shiro-an, so I substituted with lotus paste. Hope this isn't too much of a bastardization. Anyway, thanks so much for the recipe and it was really very nice. I just visited your blog. Hey, your daifuku looks definitely much better than mine. Fantastic job! Hope everyone liked it. hi, im trying your recipe as we speak, however we have no food shops local to us who sell the white and red bean pastes so (from reading some of your other comment, i am asuming that red bean paste is made from adzuki beans) i am making the red bean paste myself. It doesnt look very red, but it does taste good, and i just popped onto here to double check the recipe for the rest of the sweet. wish me luck. I'll let you know how we get on. What is white bean paste made from? i really like how stylish the sweets look with white, and would like to try this some time. I think it’s made from white kidney beans. If canned boiled white kidney beans are available there, I think you can make something similar to shiroan in a relatively easy way. I read somewhere that you drain and wash the boiled white kidney beans and process in food processor for more than 5 minutes to make white bean paste. Next you put it in a pot, add sugar and heat (over mid heat first and then low), stirring constantly. 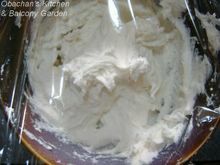 This is an easy way out, and since the skin of the beans are not removed, the paste may not be very smooth and may turn out a bit browner. The amount of sugar is said to be about 60% of the weight of the bean paste, IIRC. Hope this helps. 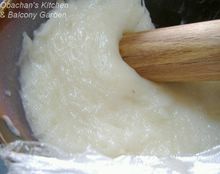 If you want a recipe for smooth and whiter bean paste, email me at the email address on the sidebar. About the corn flour for flouring the dough and worktop, is it just corn flour directly from the can or it has to be cooked? I have read from Hong Kong's sites that the flour has to be "cooked"- meaning microwave or stir-fry for a few minutes before using. The corn flour that I am talking abt is Brown & Polson corn flour. In fact, I have just tried another Daifuku recipe not long ago. I baked the corn flour for abt 15 mins before using them to flour the dough. But I was feeling kind of silly if in actual fact, corn flour can be used straight from the can. -_-"
i heard somewhere that eating potato/corn flour "raw" isnt good for you, but i only heard that somewhere! I did it! i made it with the red bean paste in the end (so it was a little different to yours, but i am going to try it with the white bean paste) and although they didnt look anywhere near as stylish as yours they tasted good. I made some for my husband and children to take to a toddler group they go to on a saturday morning that is just for fathers (no mums aloud!). I also made some very basic sushi and the children really loved it all, especially the sweet! I decided to make them some japanese style food to take in because their toddler group that day fell on childrens day (10th may) so as well as eating their japanese lunch my husband helped them make origami hats (like the one on this site: http://www.enchantedlearning.com/crafts/origami/Samuraihat/) and brought in a carp on a stick and told them about why people in japan put these on their houses at childrens day. They all had a great morning so i want to say thank you for the wonderful recipe. this is the best recipe i've found on the web! thanks for all the great pictures--it really helps to know what it's supposed to look like. anyway, i filled mine with chocolate ganache. the mochi stuff is really hard to work with though. very sticky. I just tried your recipe - I used red bean paste that I made myself since I can't get bean pastes where I live, and they turned out great! This is the best recipe for the dough I've seen! Sorry, I'm not responding to you individually, but I'm really happy that you liked my recipe. I´m from Mexico City and i will try your recipe, just a question: do you know what kind of sugar and how much sugar you need for the Red Bean Cake Daifuku? I try them since i was little (my father always loved asian cuisine) and i´m so happy for your recipe in the web. Well, i´ll wait for your comments and thanks for all that great photos! Thanks for your comment. Wow, daifuku in Mexico city?! You know how I feel when I see daifuku at a nearby wagashi shop and think about someone in a far-away country who might be trying the same thing? That way I can have a different look on some ordinary things in my everyday life, which makes my life more interesting. Really. I guess just regular white sugar is fine. The amount, of course, depends on the amount of red azuki beans you use, but in many Japanese recipes, the weight of the azuki beans and white sugar seems to be the same. Although not quite similar in the recipe but it seems to be the same thing. I've been looking for this for a long time! I've tried to do this at home a few times but it was a bit difficult. Now, with all the pictures I think I can do it much better! I love japanese food! I also think your blog is very good! I made these just a while ago (although without strawberries, because I don't have any T-T) and they were really good! I was wondering though, can they be frozen? And if so, how long do they last? I'm making a large batch to serve at a kissaten my sister and I are having at a convention (the Keikon!) in Victoria, Canada. Yes, technically, it should be possible to freeze daifuku mochi with anko paste but without apstrawberries inside, because I know the mochi skin freeze well, and anko paste, too. Actually, so many mochi shops in Japan sell frozen daifuku mochi online, and many websites say that they keep 1 to 2 months (some even said 3 months). Such frozen ones need to be thawed at room temperature. HOWEVER, I cannot guarantee that it would work the same for my daifuku, because I don't think those mochi shops make mochi skin the same way I do -- I don't think they use a microwave to make those mass-production stuff at their factories -- and they may be adding some extra ingredients to keep mochi texture soft and silky. So my hunch is -- my daifuku mochi (without fruit) can be frozen and probably keep for a few weeks, but I cannot guarantee the texture of the mochi skin to be perfectly OK when thawed. I have been reading your blog for a long while and really enjoy reading your postings and your beautiful pictures. Just made the Ichigo Daifuku and really liked it. However, something strange happened. I purchased expensive Japanese strawberries which were very sweet on their own. However, when we ate the daifuku, the strawberries had a sour though still sweet taste, and there was also a slight bitterness too. We ate the mochi, red bean paste and strawberry separately and determined that the strawberry was the one. Have you had an experience like this or may you know why it became so? Thanks lots in advance and keep up the wonderful work on your blog! Ohayou, obachan! I just tried out the recipe today. Since it's Spring, I wanted to bring in some mochi for my classmates (there are about 12 people in my class). As usual, the first try lent a few mistaks. I was hoping you would be able to help me out. If you're too busy, that's understandable too. 1. What sizes of strawberries should I use? I guess the ones I used were pretty big because I only ended up making four mochi with pretty thin skin. Here is a picture. I put a penny there to compare, and it seems skewed, but it was probably around that size. 2. I also heard I'm not supposed to use plastic wrap in the microwave. Would using a wet paper towel alter the time it's supposed to cook in the microwave? 3. The dough came out pretty soft. I don't know if this is normal or not; maybe it becomes a little harder as it cools? 4. They also came out lumpy. :( They were nowhere near as beautiful as yours. I think a mistake I made was that the flour kept the dough from pinching together to form a ball, but it came out horribly lumpy, and when I lifted one up to refrigerate, the bottom was very flat, so I think the dough may have been too soft. 5. The dough stuck horribly to the microwaveable bowl. Should I use flour or some type of nonstick spray to keep it from sticking? I didn't quite get enough dough to cover all the strawberries, but I can easily make more--I just wonder if I'm doing anything else wrong. I'm so sorry this comment is way too long. Thank you for reading, anyway! Sorry! I guess I posted the wrong link. OK, I’ll try… but now I’m trying to adjust to my new work environment, so forgive me… I don’t think I can do it as often as you want me to. Another thing I should warn you is that I’ll be using lots of ingredients that are hard to buy outside Japan. For example, we are so spoiled about anko (sweetened bean paste) here. The ready-made anko is available at most stores and I almost never make them from scratch. And various kinds of rice flours, too. I bet I’ll be using the different kinds of rice flour that most people can never find in their countries, which could be frustrating to the readers. BTW, I don’t know what kind of fruit cake you are talking about…??? Hi. Thanks for trying out this recipe. OK, let me do my best to answer your questions, but honestly, there’s not much I can help. 1. It’s great that strawberries come in so many different sizes in your country. The size of strawberries are usually about the same around here, so when I can’t find small ones, I just cut them the way I want like in the photo on top of this post. 2.In this country, we use plastic wrap in the microwave. I have never tried this with wet paper towel, and I don’t know if it affects the cooking time. 3.Yes, the dough comes out soft. 4.I’m not sure what you meant by “lumpy” because I have never seen any lumps in the dough when I tried, and never heard of someone having that kind of problem. 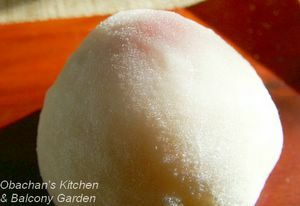 It is true that if you used too much corn starch, it becomes harder to seal the daifuku skin. And I’m not sure what you mean by the bottom being too flat. I thought that was the way it usually is. 5.Yes, the dough is terribly sticky and it does stick to the bowl. I guess the majority of us just take it for granted here. Using more flour wouldn’t help as it will just be absorbed into the dough and make the dough tougher. Of course I can’t say “NEVER use nonstick spray” if you don’t mind your daifuku being greasy. It’s just not the same thing as our daifuku. I can’t really tell what you are doing wrong even after seeing your photo. Sorry.. But I just wonder… Have you ever thought about cutting the strawberries? Hi Obachan. I thought I'd like to tell you that white bean paste is actually white miso paste. Im sure you know that miso is a type of soy bean that makes really good suop. Other then that I know next to nothing about it, let alone how to make it, but your kidney bean idea is a good substitue. Forgive any of my atrosious spelling errors, ive never been good at it. No, sweetened white bean paste (shiro-an)is not the same thing as white miso. Saying that they are the same is almost like saying that soy sauce and soy milk are the same thing because they are both made from soybeans. Miso is made by fermenting soybeans and it is very salty (and the texture is much softer). White miso contains less salt and tastes a lot milder than other types of miso, but still it is too salty to be used as a wagashi filling as-is. 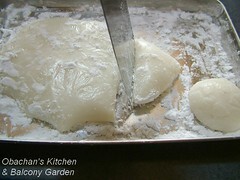 White miso is sometimes used for wagashi to add an extra flavor, but never as an equivalent or replacement of shiro-an. I don't recommend anyone to fill ichigo daifuku with white miso. You might think that adding loads of sugar would adjust the taste and solve the problem, but doing so does not decrease the salt content of the miso which may be bad for your health. Besides, I don't know how it would go with the strawberry in ichigo daifuku. It will never be the same as using shiro-an. I am from Montreal, Canada. 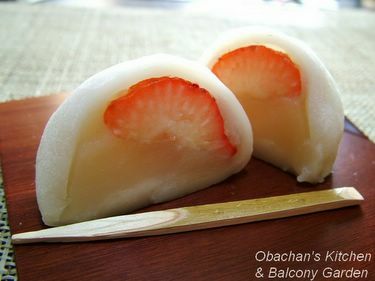 Sumimasen, i haven't try your ichigo daifuku yet, but I am planning to do it in the next few days. They look so... Hontouni oishiidesu! I read all the comments for this recipe and I feel I had to add something. Ichiban, doumo arigato gozaimashita for all this work. Niban, please when you will have some time, can you add more recipes? Onegaishimasu! I have been looking for a daifuku recipe for a week now and all the ones I found before yours where from US and China. So, sumimasen, i did not really trust them. So it feel really great to see that this recipe is made by a real nihonjindesu. Sumimasen. My boyfriend is japanese and i would like to make a lot of japanese sweet for him. Do you know how to make them? Sorry, to ask you so much. P.S. : Gomen nasai, nihongo wo benkyoshimasu. And I am not really good at it yet. Demo... Ganbarimasu! I just made some of the dough and i must say it didn't turn out to well *sigh*. But after looking around i realised thatt i had bought the wrong rice flour. So doses that mean you can't uses just good ol' rice flower and add something to it or what? This is Vera again. I just made these again (almost a year later again) and used anko filling. The bitterness prevailed. Thus, I WILL try a white bean paste next time. It is helpful to find an asian grocery store in your city or the nearest large city. I live in the mountains of Colorado and have found boxes of Mochiko in Grand Junction and Denver at the asian market (several in Denver on Alameda between Federal and Santa Fe,many excellent asian restaurants in this district also), also the canned sweet red and white bean paste can be found here! I think experimenting with mochi is the key as I have eaten orange flavored mochi, coffee mochi, etc.with hidden "treasure" in the middle. You could sweeten the white bean paste with orange, pineapple flavoring etc., or maybe put a caramel in the middle of a coffee flavored mochi. apparently the cornflour used to dust the daifuku needs to be 'cooked' rice flour as this helps the daifuku stay soft and is better for you then raw cornflour. you can buy this from chinese supermarkets and it is used in recipes for banana rolls~(the soft white rolls with bean paste inside found in chinese supermarkets). im not really sure how it keeps it softer but i always get daifuku staying softer for longer when i coat it in this. 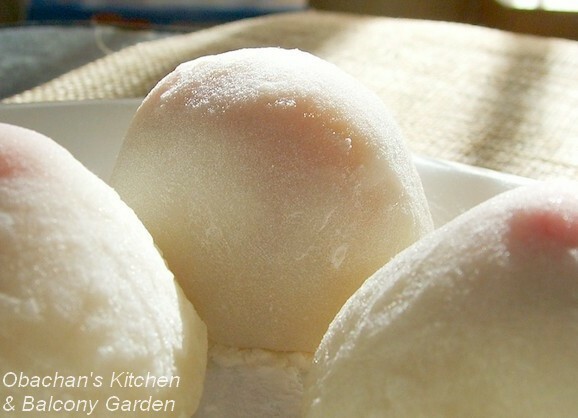 I've been looking for a good recipe to practice making daifuku and your recipe seems great. I'm going to attempt to make momo daifuku with shiro koshi-an and matcha daifuku, hopefully it will all go well. I was wondering what type of fillings are used for tsukimi daifuku? Thanks for the great recipe. i tried these daifuku the other day, but i added maccha powder and used anko as a filling. recipe was great. Thanks for the recipe, I'm planning on trying it this weekend but I don't have a microwave. How can I modify the recipe for a traditional oven? I don't think a traditional oven is a good idea. In that case, boiling would be the choice. Make the dough (mixture of the rice flour and water) as hard as ear robe, pat it into several flat disks and drop in boiling water. They are done when they float. Then knead it in a bowl with a wooden pestle. To tell you the truth, I haven't tried this myself, so I don't know if it works or not. You may or may not need to add some water and knead the dough in a pan over a very low heat.